on your car's infotainment screen. With Sygic Car Navigation, you can enjoy all advanced navigation features on your vehicle’s infotainment system. Just connect your smartphone through the smartphone to in-dash connectivity with the vehicle's infotainment system and the smartphone navigation will be projected on your car's screen. A simple interface that's less distracting and lets you use smartphone Sygic Car Navigation application in 'Car Mode' on your infotainment screen. Knowing speed limits is extremely important, but sometimes it gets difficult to keep track of them. Luckily, Sygic Car Navigation includes Speedometer and Speed limits, so you will always see your current speed and the maximum allowed speed on the road you are driving on. Get Traffic information by Sygic Car Navigation. Find the quickest route to your destination based on current road conditions. 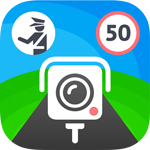 Up-to-the-minute information from the world's largest online speed camera database will help you to be safer on the road and avoid costly tickets. Voice guided navigation with Spoken Street Names, based on text-to-speech synthesis, will provide you with precise instructions that tell you the names of streets and cities, as well as the directions and distance to each manoeuvre. Just listen to the accurate spoken directions and follow the instructions to reach your destination comfortably and safely. Voice guidance with turn-by-turn instructions is available in more than 40 languages. Park easily with live information about 50 million parking spot prices and vacancies in 75 countries. With Sygic Car Navigation, you can see the prices and the availability of parking spaces in real time, so you can make the best decision where to leave your car. Parking suggestions appear 1 km / 0.5 mile from your destination. Compare fuel prices and find the nearest and cheapest gas stations. You can find the best offers within seconds and Sygic will show you the fastest route to the petrol station of your choice. Just set up your fuel type and Sygic will automatically suggest nearest gas stations with their current prices. The fuel prices are frequently updated so you will always have an up-to-date overview of where you can get the best price. Dynamic Lane Guidance is one of our advanced safety features. It helps you to make your way through complicated traffic situations by guiding you into the correct lane. It provides a clear look ahead, showing you which lane you should drive, so you can stay relaxed even when driving in an unknown city. You will change lanes safely and drive smoothly with enough time before making a turn. What will you get with Car Connected Navigation? Offline Maps are great when going abroad or to destination with bad coverage of GSM (mobile) service. It can save you a lot of trouble and/or money on roaming cost. Just download the maps and route directly with your smartphone. With Sygic Car Navigation, you can enjoy advanced Premium navigation features on your car’s infotainment system. Utilize the latest offline maps with lifetime updates, Traffic Information, Speed Camera warnings, Dynamic Lane Assistant, Fuel Prices, millions of POIs and more.